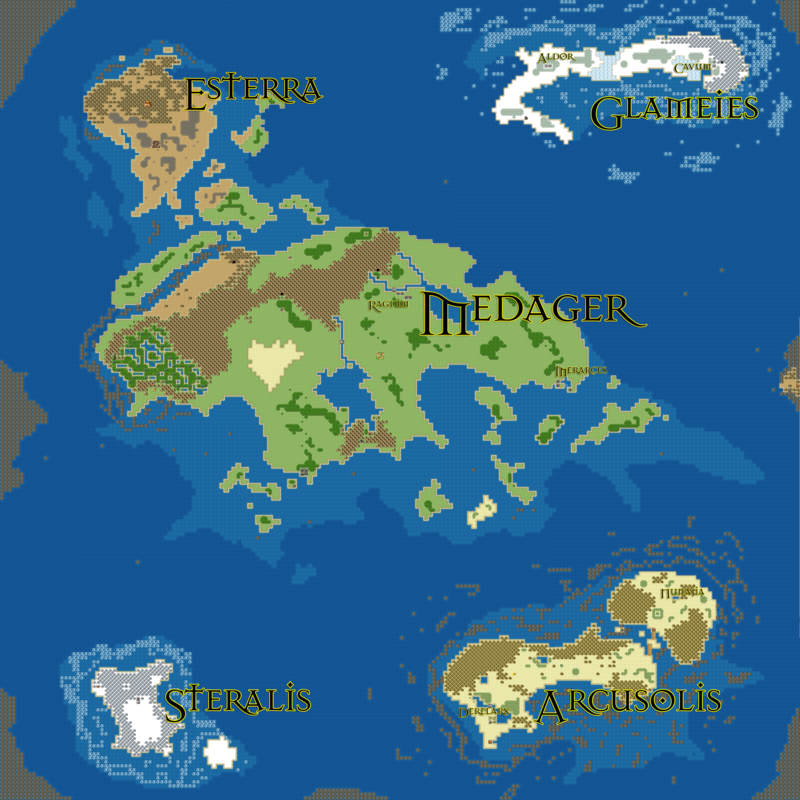 The world of Idavoll is divided into several continents: Medager, the largest continent; Glameies, the icy continent to the northeast; Esterra, the barren subcontinent to the northwest; Arcusolis, the desert continent to the south; and Steralis, the small snowy island to the southwest. Idavoll itself is fairly small, though it is not an actual planet. Idavoll is a floating world that hovers above the endless oceans of the planet Iravelon. Medager is the continent from which Ian and his friends hail. Specifically, they come from a riverside town called Ragdim, on the northeast side of Medager. The group will travel through the port town of Merarces in Medager, the town of Aldor in Glameies, and the city of Derelarx in Arcusolis, as well as many other smaller human locales. Other locations include the Esterran Mountains, the Maginculta Desert in Arcusolis, the Marshes of Doubt in western Medager, the edge island of Torra to the west, and many others. Idavoll, however, is only part of the setting of the Iravelon series. Iravelon itself is a massive planet composed almost entirely of water. 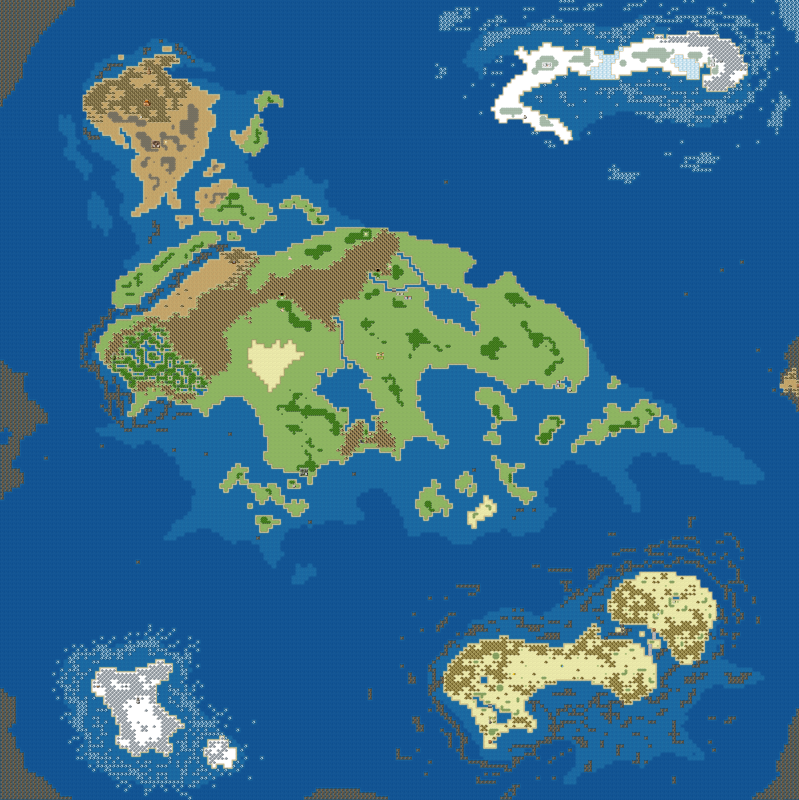 Idavoll is actually an island that hangs in the air over the planet’s surface. Several other floating worlds hang in the air above the surface of Iravelon’s oceans, though they never have much contact because of the massive distances between them. Click the picture to see a higher res. version.